A well constructed house with a strong foundation and beautiful architectural features catches attention of one and all. But, if after entering it, you witness the spectacle of messy or rather neglected interiors, then the whole image of the house gets tarnished. Designing of the residential interior spaces are of great significance and vitality to transform a house building into an elegant and stylish home. Owing to the soaring needs for visually, aesthetically and mentally pleasing interiors for homes, residential interior designing industry has reached the peak of popularity and so is the demand for residential interior designers. They are experts in interior designing, who perform the task of beautifying your living space and making it appealing. There is huge demand of residential interior designers in Delhi, because people understand the value of home and want to make it as pleasing to the mind, soul and senses, as possible. It should be so as Home is where the heart is! Home is the only place where you can experience the coolest version of yourself, do what you intend to and feel at ease with all the warmth, comfort and peace around. Home is where love dwells, moments are spent and emotions are felt, which is why home needs to be designed and decorated with all the care and affection, giving you memories to be cherished for a lifetime. Designing a home is an art in itself, requiring due attention, precision and aesthetic sense. Designing the residential space is no child’s play since it is based on many factors which affect the psyche and an interior designer is well versed and qualified to understand such factors and your specific requirements. Being a layman, you may not be able to consider the intricacies of designing, if you choose to design your home by yourself. Ambience, colour effect, patterns, designs, Vaastu and many more aspects affect the way you feel at a particular place, which is why whether it is your kitchen, bathroom, living room, kids’ room, guest room or dining area; all need to be designed and decorated by an expert residential interior designer. He/she will be the one to design your residential area, considering the nitty-gritty of designing as well as your needs and desires. To design a living room, where you spend all your leisure time, when at home, a living room designer takes care of your preferences besides utilising the basics of designing the living space. Creating an ambience that soothes your mind, matches your needs depending upon the time you spend there and does not hinder your pleasures, is the aim behind designing the living room interiors. When it comes to kitchen area, the idea is to help you manage your space well so you are motivated in the art of cooking and your love for food enhances. A Kitchen interior designer gives due consideration to designing the space in a way that the area does not look messy, smartly stores all your kitchenware, has enough room to stand and cook comfortably and is visually appealing. El Nido– Interiorz by Shalini is a renowned name among the residential interior designers in Delhi, offering consultation gauging your needs, creating aesthetically appealing designs for homes and maintaining a healthy client service relationship. 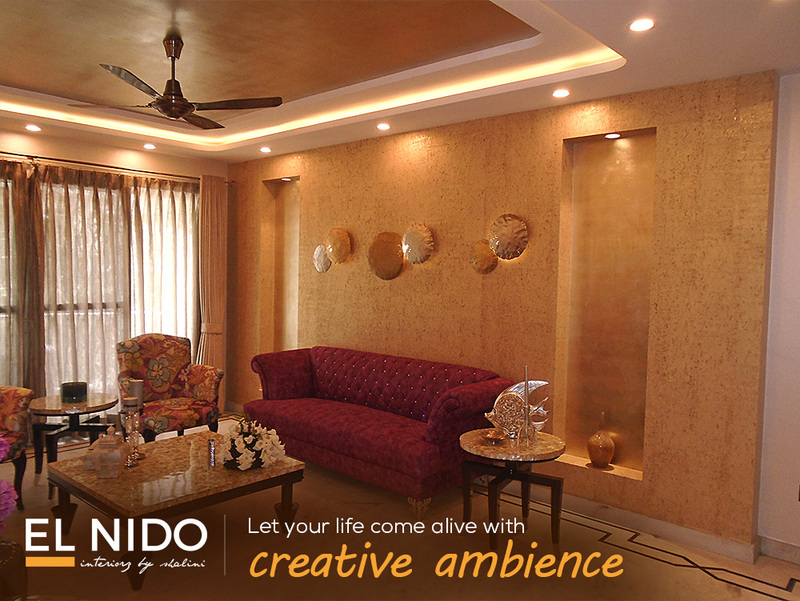 If you want to get your residential space designed by experts in the field and get a pleasing ambience for your home, El Nido- Interiorz by Shalini is your ultimate stop.